Try to find the source of the behavior. Although it may seem senseless for the person to be agitated, restless and worried, the NIA experts say there’s usually a reason. Some possible causes include pain, depression, or stress; too little rest or sleep; constipation; soiled underwear or diaper. Try to find out if the patient is suffering from any of these. There can be some bigger causes as well. The NIA says these include disruption or change in a familiar routine or person. (It’s essential to establish a routine for the patient, such as bathing, eating and dressing at the same time every day.) There may be too much noise or too many people. Additionally, the NIA says, patients may react badly when other people push them to do something – for example, to remember people – that has become difficult or impossible with AD. Feelings of loss as well as social isolation can play a part, and the interaction between medicines should be considered. To avoid situations in which the patient is aggressive or agitated, the NIA suggests being on the lookout for early signs. Then you can act – for example, by looking for the cause of the agitation – before the situation escalates. Don’t avoid taking action in the hope that the situation will go away on its own. That can only make things worse, the NIA says. Work on dealing with any worried behavior you yourself might be exhibiting. The NIA recommends that you take it easier if you think that your worries may be influencing the patient. Try to take a break from caregiving. Try to shift the patient’s attention by focusing it on a favorite activity or object or food. Keeping well-loved photos, scrapbooks and the like around the house can make the person feel more peaceful, the NIA says. Calmly reassure the patient. Listen to the cause of his or her behavior, the NIA says, and try to show that you understand. Gently touch the patient. Make sure the patient’s environment isn’t too noisy. Too many people and too much clutter may also be sources of agitation. At the same time, let the patient have as much control as possible over his or her life. Create a peaceful environment, the NIA says, through soothing music, reading or walks. Don’t let the patient overdo caffeine, sugar or junk food, the NIA says. If the problem persists, the NIA says, talk with the patient’s physician. He or she can give the person an exam to see if there are any medical causes for the behavior, including pain, depression or a particular medicine. It’s also important, the NIA says, to check the person’s vision and hearing. Problems in those areas can contribute to confusion and subsequent agitation or aggression. Protect yourself and anyone else in the area. If you have to stay a safe distance from the person, do so until the behavior stops. As much as you can, stop the person from hurting himself or herself. Ask the patient’s doctor or Alzheimer’s specialist if medicine may be needed to prevent or reduce agitation or aggression. 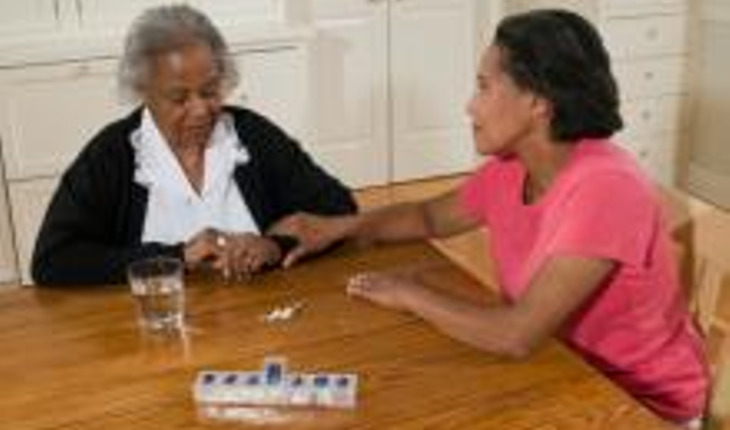 For more on senior health issues, visit www.nia.nih.gov.